The COST Action PROTEOSTASIS (http://cost-proteostasis.eu/), chaired and coordinated by Dr Rosa Barrio at CIC bioGUNE has just released its latest achievement – the final dissemination article. This Open Access article published at Trends in Biochemical Sciences (TiBS) is an overview of the latest advancements in the field of protein homeostasis, including posttranslational modifications by ubiquitin family members and protein turnover by proteasome, autophagy, and lysosomal systems in health and diseases. Proteostasis is a transversal subject of research implicated in a plethora of biological processes in eukaryotic organisms, which results in a highly heterogenous field, thus it is considered a major feature of basic, fundamental and clinical research. The publication- “PROTEOSTASIS: A European network to break barriers and integrate science on protein homeostasis” – summarizes the effort of the network to integrate research on protein homeostasis in Europe, including a great variety of activities carried out by more than 270 research groups, including researchers from 30 countries who covered all scientific areas aforementioned. By reaching hundreds of European and international scientists working on protein homeostasis, PROTEOSTASIS developed a large exchange platform to strength connectivity and boost creativity, contributing to defragmentation in this field. PROTEOSTASIS organized or co-organized 14 scientific meetings and workshops and eight training schools- some of them in collaboration with relevant European or national bodies in the life sciences such as EMBO, FEBS, and other scientific societies-, as well as 47 scientific staff exchanges among participant groups. Dissemination instruments included the website, webinars, newsletters, and social media. The network contributed significantly towards reversing the national and scientific fragmentation of research efforts within the European research area and beyond and facilitated the interchange between academic groups and the private sector. The impact and sustainability of PROTEOSTASIS is also demonstrated by the research and innovation projects carried during the last 4 years. Those efforts turned in more than 50 joint publications in peer-reviewed scientific journals plus three thematic books – “Proteostasis”, “SUMO” and “Plant Proteostasis”-, with additional 74 contributions of network members. Regarding new innovative networks, we would like to outline the following European Marie Curie Innovative Training Networks (ITN): TrainERS (train-ers.eu) on endoplasmic reticulum stress; META-CAN (metacan.eu), combining cancer metabolism, cell death, cancer immunity, data analysis and immunometabolism; UbiCODE (ubicode.eu), deciphering the mechanistics of the Ub code; or TRIM-NET, exploring the functions of TRIM E3 ligases. As a result of the N-term 2017 meeting co-organized by PROTEOSTASIS, the International Society of Protein Termini (ISPT, http://ispt.world/) was established for scientists with a shared interest in protein N- and C-terminal modifications and their effects on protein functions. Reference: Dissmeyer N, Coux O, Rodriguez MS, Barrio R; Core Group Members of PROTEOSTASIS. 2019. PROTEOSTASIS: A European Network to Break Barriers and Integrate Science on Protein Homeostasis. Trends Biochem Sci. pii: S0968-0004(19)30007-6). 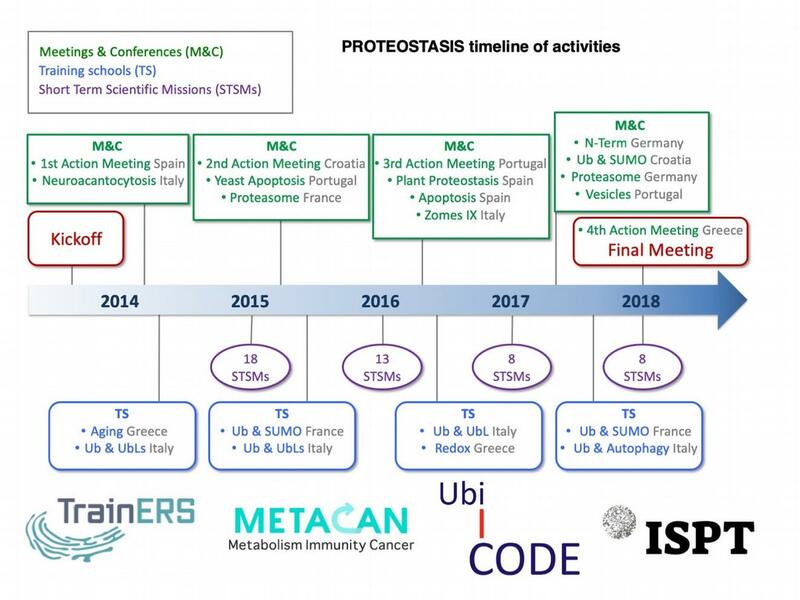 Achievements and Milestones of the PROTEOSTASIS Network: An Overview of Activities and New Funded Networks. Abbreviations: Ub, ubiquitin; SUMO, small Ub-like modifier; UbLs, Ub-like proteins.